The duplicity and hypocrisy of the mainstream media coverage of politicians, based on party affiliation, could not have been more in evidence than it was this past week. New Jersey’s Governor Chris Christie’s scandal was trumpeted across the headlines this week as if it were a five alarm fire, while much more serious scandals with national implications, are often hardly reported at all. It was revealed this week that members of Christie’s staff had intentionally closed four lanes of George Washington Bridge, connecting Manhattan to Fort Lee, New Jersey. Christie’s staff closed the lanes for four days to create a traffic quagmire to punish Fort Lee’s mayor, Mark Sokolich, for not endorsing Christie in his bid for reelection as New Jersey’s governor. In a two hour, nationally televised press conference, Christie admitted he was “blind sided” by the revelation, and had no prior knowledge of the scheme. Ensuring that someone was held accountable, Christie fired his two aids complicit in the plan. There are two aspects of this narrative that are immensely disturbing. The first is the media reaction to the story. According to Media Research Center, “In less than 24 hours, the three networks have devoted 17 times more coverage to a traffic scandal involving Chris Christie than they allowed on Barack Obama’s Internal Revenue Service controversy.” MRC documented 34 minutes and 28 seconds of coverage by ABC, CBS, and NBC dedicated to the Christie scandal, versus a scant, “two minutes and eight seconds for the IRS targeting of Tea Party groups,” over the past six months. To a reasonable person, the story of potential political bullying by a governor, closing lanes on a bridge, can in nowise be 17 times more significant than a president that uses the most onerous agency of the federal government to do his bullying against his political enemies. To a reasonable and rational electorate, the obvious bias in reporting would cause a mass exodus from the mainstream media until they started reporting accurately and with equitability, without regard for party affiliation. The media have been raising the question whether Christie can be believed when he claims he knew nothing about it. 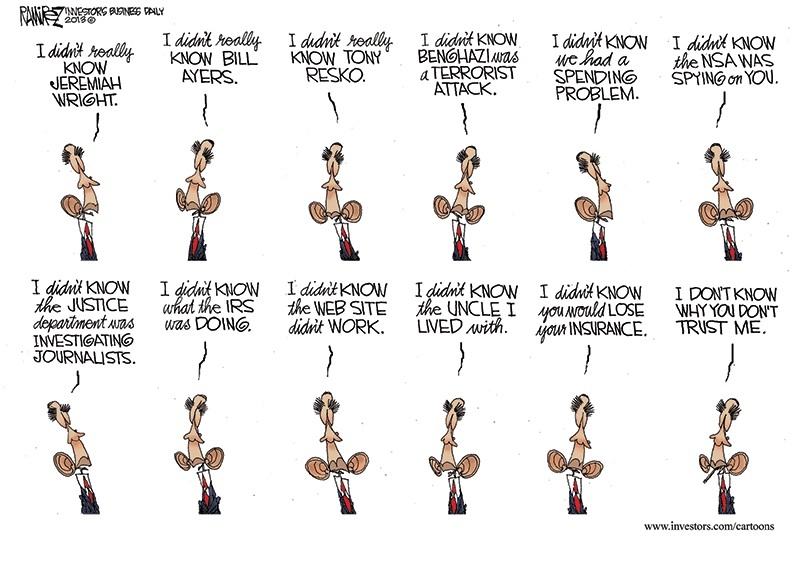 Yet they are unsurprisingly reticent when it comes to Obama’s inexorable “I didn’t know about it until I read it in the paper,” soliloquies he employs to excuse his and his administration’s irresponsibility. 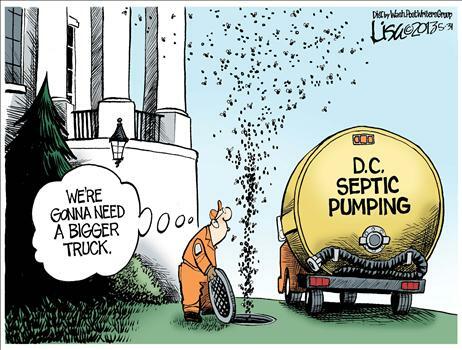 In fact the mainstream media have been AWOL in reporting just the few foibles and lies listed here: “I will have the most transparent administration in history;” “The stimulus will fund shovel-ready jobs;” “I am focused like a laser on creating jobs;” “The IRS is not targeting anyone;” “It was a spontaneous riot about a movie;” “The public will have five days to look at every bill that lands on my desk;” “It’s the previous president’s fault;” “Whistle blowers will be protected in my administration;” “I am not spying on American citizens;” “It’s just like shopping at Amazon;” “I knew nothing about ‘Fast and Furious’”; “I knew nothing about what happened in Benghazi;” and perhaps the best of all, “I will restore trust in government.” If any of these claims had been uttered by our previous president, the press would still be harping on them. If that principle applies to Christie, a state executive, shouldn’t it apply even more aptly with the executive leader of our nation? Why are so few of Obama’s constituents raising the same question? Why is Obama exempted from culpability in the creation of a culture of corruption and incompetence in the executive branch? It was refreshing to actually see someone held accountable for something in government, as Christie dismissed those involved with what is now being dubbed “Bridgegate.” We have witnessed so many faux pas, blunders, mistakes, incompetence, and outright lies over the past five years at the national level, and there has been little accountability. When people are hired, especially for the public good, and they, by their actions, tarnish the people’s trust in their integrity and competence, they should be held accountable. Here are just a few of those who have contributed to the culture of corruption at the national level, by deceit and obfuscation, and have not been held accountable: Eric Holder, Timothy Geithner, Van Jones, Susan Rise, Lois Lerner, Hillary Clinton, and Kathleen Sibelius. In fact, books have been written, documenting the culture of corruption in the White House. If Christie is to be responsible for the culture in his administration, shouldn’t Obama be held accountable for his, especially considering the gravity, breadth, and impact of the latter? Holding a position of public trust requires responsibility and accountability. Not only has very little been shouldered by this administration, but also the media have done little to hold them accountable. It shouldn’t be too much to ask for the media to be equitable and fair in their coverage of elected officials, irrespective of party affiliation. And we, the people, should demand it of them!